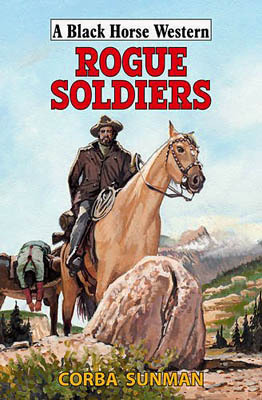 Captain Slade Moran, US Army investigator, is hunting the killer of an officer when he rides into Grey Ridge, having lost the trail of the fugitive. Fresh orders await him at the nearby army post, and he is plunged immediately into big trouble. Seven troopers have recently deserted from the fort – an unprecedented number, and none of them have been caught. Also a young officer has been court-martialled for stealing and drummed out of the army. After examining the two cases, Moran is up against unscrupulous men, vicious killers and a rogue officer. He’ll have to lay his life on the line before he can restore justice. This book is filled with puzzles and questions as the introduction of each new character seems to add to the problems facing Moran. Even when he begins to work out who is involved he, and the reader, are still in the dark as to just what is going on. All this creates some great hooks that kept me turning the pages, making this a difficult book to put down until the end was reached. Corba Sunman is a popular Black Horse western writer – if I’ve counted right, this is his 38th book – who knows how to grab a readers’ attention, build his plots through a number of twists and turns, and create interesting characters. Sunman’s descriptive passages paint vivid imagery and his action scenes are really well written. Slade Moran has appeared in at least one other book, Colorado Clean-Up. I’m not sure if there are any others but I think it’s time for me to find out as this army investigator is a great lead character and I’d like to read more of his assignments. If you’ve not tried a Corba Sunman book yet, then this could well be an excellent place to start. General Sherlock has issued an order to exterminate the bandits of Taney County; shoot them like animals and hang all prisoners. So when sixteen-year-old Billy Stark falls into a trap and attempts to steal an army payroll, the military are hot on his trail. Fleeing for his life and burdened by a wounded companion, Billy faces extreme peril and is lured into a world where lynching, torture and bullets have replaced the law. Striving to maintain his morality, Billy finds himself drawn deeper into a web of evil…. Like in many of Mark Bannerman’s books the author combines fiction with historical truth and in this story Bannerman’s hero finds himself riding with the Bald Knobbers, a masked gang of vigilantes who don’t need much of an excuse to drive people out of Taney County, and if they don’t go, kill them without a second thought. Of course there is opposition to them in the form of the Anti-Bald Knobbers who seem to take pleasure in ambushing and killing the vigilantes at any opportunity. If this isn’t enough of a deadly situation for Billy Stark to find himself in, he’s also being hunted by the army, struggles to find anyone he can trust, and is falling in love…. 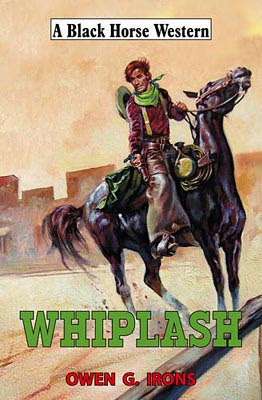 Unusually for a Black Horse Western this story is told in the first person, through Billy Stark. Bannerman writes in an easy to read style that never lets up in pace, and springs surprises along the way. There’s plenty of action as Billy finds himself reluctantly carrying out missions for the Bald Knobbers. Does Billy escape the clutches of the Bald Knobbers, free himself from the pursuit of the army, and get the girl? Can a story of this type really have a happy ending? Of course I can’t reveal any of the answers here but will say that the closing pages will stick in my mind for a long time. 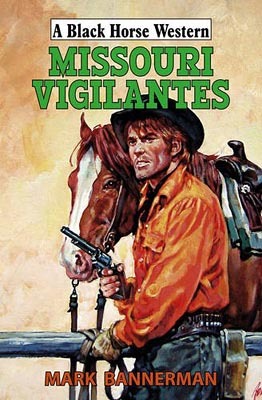 Missouri Vigilantes is a thoroughly entertaining book that has left me looking forward to Mark Bannerman’s next book, Journey into Jeopardy, published in December. Sadly this may be the last as the author behind the pseudonym of Mark Bannerman, Anthony Lewing, passed away in June of this year. Skye Fargo has learned the hard way not to depend on people too much. But he’s always been able to rely on his trusty Ovaro stallion. So when some lowdown bushwhacker makes off with the prized beast, he isn’t about to just let him get away. Soon the owlhoot will know that messing with the Trailsman’s horse has earned him a trip to hell…. Long-time readers of The Trailsman series will know that when Fargo gets mad then some savage retribution will be dealt out, and stealing the Ovaro sure leads to a brutal reckoning. And if you thought from the above blurb that dealing with the culprit would be the conclusion of the story then, like me, you’d be wrong. There’s more to this fast moving tale than tracking down the person who stole the Ovaro. Someone has plans for the stallion – and many other horses too – and the author kept me guessing as to what that was. And once Fargo discovers just what this is his temper is on the boil again and he sets out to end this scheme, only to find himself facing an opponent backed by more hired guns then he can ever hope to take on alone…but when has that ever stopped the Trailsman? Threatened with the death of the Ovaro Fargo finds himself forced to take part… nope, I can’t reveal that here as it’ll spoil the story for all those intending to read it. So, once more, Jon Sharpe (in this case David Robbins writing behind that pseudonym) has written a gripping, action-packed, story filled with excellent descriptions and tough dialogue, that sees the darker side of Fargo come to the fore, resulting in a superbly entertaining read. If you want a superbly written tale filled with plenty of twists and turns then you need look no further than this short novel by one of the top western writers working today. 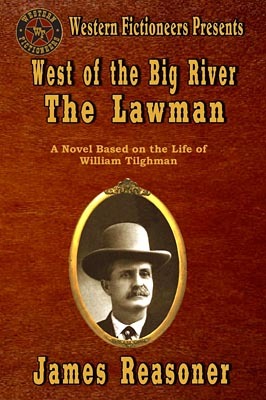 Each of the books in the West of the Big River series uses a real person as the main character(s) and James Reasoner’s portrayal of Tilghman comes across as very believable, capturing his many admirable traits perfectly, as he also does with the lawman’s harder side. The story is paced perfectly and filled with exciting action, such as the scene involving a fire which will have you wondering how Tilghman can possibly escape with his life. This story is a fictional tale, but as James Reasoner comments, it is loosely based on true incidents. 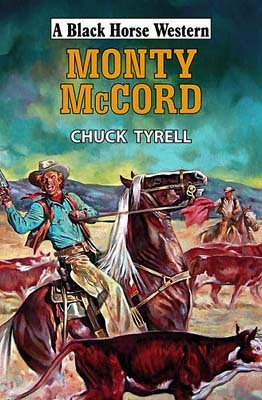 In the expert words of this author truth and fiction blend smoothly in an entertaining story that should be on the reading list of all western fans. Sandy Rivers was taking a well-deserved rest in the trail head town of Durant, Colorado when the dying man staggered to his saloon table. The injured man had been whiplashed half to death and then finished off with a knife in his back. He had come to warn Sandy of something but died before he could finish what he had to say. If Sandy had let that be an end to things, he would not have been pursued across the desert, shot at, charmed and lied to by a beautiful woman, then witnessed the death of his home ranch’s owner, before finally meeting the killer with the whip. This starts out as a fairly straight-forward storyline, but when Sandy heads out to stop the killer with the whip the plot begins to twist and turn with each new person he meets. It gets even more bewildering when Sandy finds himself riding alongside the daughter of his now dead ex-employer. All this serves to hook the reader and makes sure this is a difficult book to put down before discovering just what is really going on. 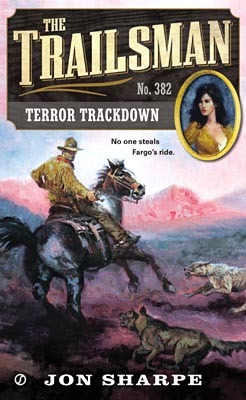 Owen G. Irons – a pseudonym used by Paul Lederer – has come up with a very entertaining read. The book is fast moving from the start and his descriptions paint vivid imagery within the minds’ eye. His characters will have you rooting for them, or not depending on which side of right or wrong they walk. And who will easily forget the beat-up old horse Sandy finds himself riding? So, once more, I’m left looking forward to the next book by this author – under whichever of his pseudonyms it is published. What made saloonkeeper Wilbur Enright so eager to get his hands on the keys to the bank’s safe, after the disappearance of the Sheriff, Clint West? With Luther Parry, the assistant bank manager, and his wife, Lucy, also missing, and three dangerous-looking strangers new in town, serious trouble threatens. Murder, bank robbery, kidnapping, ambush, flash flood, gunfights, and more, all in the name of greed and ambition, keeps this story galloping forwards at a breathless pace. Most of the characters caught up in the various dangerous situations are unaware of other deadly events involving friends, those they are trying to rob, or have killed. All trails are on a collision course that brings everything to a violent conclusion. The story throws many questions at its well-drawn characters, switching between them more or less scene by scene, chapter by chapter. As the plot becomes more involved you’ll find yourself wondering who is going to come out victorious…even the three strangers, planning a crime of their own, will have you hoping they survive. This is the first book by D.D. Lang I’ve read, although I have read one other by the same author writing under one of his other pseudonyms. It also seems this author dropped out of sight for a number of years, and on the strength of this book, and the previous one I’ve read, this is a very welcome return, and looking through Hale’s future publications it seems there are more of this authors books to come, something I am very much looking forward to. Monty McCord is a top hand, but he’s got a hot temper. After killing young Hartley Billings he’s on the run, and now old man Hunter Billings has sent his riders to catch up with him. But US Marshal Swade, Ellen Watson and her Flying W crew are on the lookout for Monty, and will do anything to keep him alive. Putting him in charge of a herd and betting Ellen’s ranch on his cowboy skills is a risky move. Can he get two thousand cows from Colorado to Wyoming? Or will the rustlers, and Monty’s pursuers, have their day? Monty McCord is a great character, his devil-may-care outlook to life means he jumps into all kinds of situations without thinking, this attitude getting him into trouble time and again and this time could well be his last. But Chuck Tyrell has some neat twists waiting in store, such as Billings health problems and him teaming up with Watson - I can’t reveal more about either of these events without spoiling the story for those intending to read it. Chuck Tyrell (real name Charles T. Whipple) writes in a very readable style. His descriptions put you right in the thick of the action and his dialogue is believable. He regularly switches from character to character, often leaving them in suspenseful situations thus ensuring the book is difficult to put down before the end is reached. If you like well told traditional westerns filled with twists then this book is certainly worth considering. For Union Army spy Grant Bonner, the war can't end soon enough. Tired of living a life of deception, he desperately wants to put his past behind him, but agrees to one last assignment. The mission is compromised and Bonner is entangled in an intricate conspiracy. Ambushed and left for dead, he recovers only to learn his battle for survival and justice has just begun. Accused of the cold-blooded killing of several fellow soldiers during a train robbery, he makes a daring escape and becomes the target of an unrelenting manhunt. 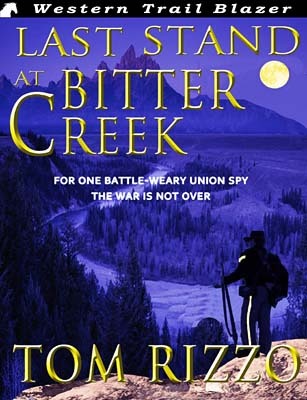 For some soldiers, the war isn't over, and won't end until Bonner makes his Last Stand at Bitter Creek. 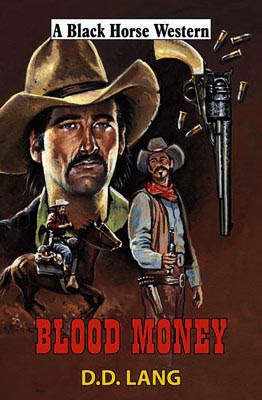 I think I’m right in saying this is Tom Rizzo’s first western, and what a debut it is. His thoroughly gripping tale merges fiction with true incidents such as the missing gold shipment and the theft of the document. Bonner’s struggle to complete his mission, and stay alive, had me enthralled from the start. The twists and turns of the fast moving plot hooking me completely, making me wonder as to just who was pulling whose strings. With its intriguing action-packed plot this book proved to be a very entertaining read. The end leaves an opening for a sequel and if Tom Rizzo chooses to write one, I’m sure I’ll be reading it.